Lab Technician, Office Assistant, Lab Assistant posts. Eligible candidates can apply for IISER Recruitment vacancies using the official website of IISER @www.iisermohali.ac.in. Applications will be received to the given address on or before 02-06-2017. IISER Recruitment selection is based on written test and Interview. 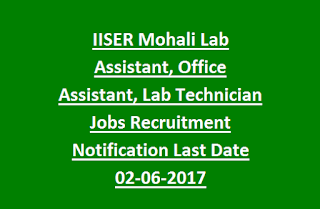 For more details of Indian Institute of Science Education and Research (IISER), Mohali Recruitment 2017- Vacancies, Age, Pay Scale, Application fee, Application procedure and other details are mentioned below. 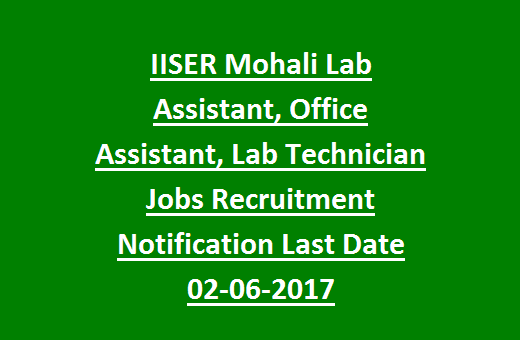 Click here to see the official notice of IISER Mohali Recruitment 2017. Closing date to receive applications: 02-06-2017. 1. Assistant Register: 03 posts. 2. Medical Officer (Lady): 01 post. 4. Technical Assistant: 02 posts. 5. Lab Technician: 02 posts. 6. Office Superintendent: 05 posts. 7. Office Assistant (Multi- Skill): 07 posts. 8. Lab Assistant: 10 posts. Office Assistant (Multi- Skill), Lab Assistant: Rs. 5200/- to Rs.20,200/- plus Grade Pay Rs.2800/-. Lab Assistant: Must have completed Bachelor’s degree in Physics/Chemistry/ Biology with at least 02 years working experience in teaching laboratory. Office Asst. : Must have completed Bachelor’s degree in any discipline with 2 years work experience in Central/ State Govt organization. Lab Technician: Must hold B.E/ B. SC in Biology/ Physics with 02 years working experience. See the notification for other posts qualifications. Candidate should have upper age limit of 32 years as on last date of the receipt of application for the current recruitment vacancies. For Age relaxations see the notification. Candidates applying for IISER Mohali recruitment selection is based on written test/ Interview. No application fee for SC/ ST/ PWD/ Woman candidates. Candidates need to go through the IISER official website@ www.iisermohali.ac.in to apply for current recruitment vacancies. Fill the application form with all particulars in prescribed format and send with self attested copies of certificates, marks sheets, pass port size photo and other documents to the following address. Last date to send application form is on or before 02-06-2017. Knowledge City, SAS Nagar, PO Manauli, Mohali, Punjab- 140306. Please share this IISER Recruitment Examination 2017 article to your friends via social web sites.